In Glasgow today, Ed Miliband will seek to go beyond the process-driven debate over independence for Scotland, seeking to make a positive case for the Union. In a speech in Glasgow later today, Ed Miliband will seek to go beyond the process-driven debate over independence for Scotland, seeking to make a positive case for Scotland to remain within the Union. “I say let’s confront the real divide in our society. Not between Scotland and the rest of the United Kingdom. But between the haves and the have-nots. “I come here today with humility about the scale of challenge for Labour – just nine months after we lost the Scottish elections. Miliband will deliver his speech following a weekend of yet more debate and discussions over Scotland and its future. * The Scottish Sunday Express carried a poll showing 51% of people in Scotland support independence, coming days after the New Statesman put the ‘yes to independence’ campaign just one percentage point behind those against. “We tested two different questions asking if Scotland should be independent. * Salmond’s vision of an independent Scotland attracting global investors with ultra-low corporation tax was dismissed as “a fantasy”. “No-one is going to allow Scotland to have a low corporation tax. That’s just a fantasy. “If Scotland’s an independent country, the EU will not allow it. It’s a non-starter. What has happened on corporation tax is Ireland has this low rate and everyone around the EU is determined that that should never happen again. “So Scotland would have to negotiate EU membership – it wouldn’t be difficult, everyone’s going to have Scotland as a member – but you can be absolutely sure that one of the conditions is that you don’t have a 12.5% corporation tax rate. The UK might veto membership until Scotland takes on RBS, HBOS and a Barnett formula share of the debt. Nonsense, this was cleared up a couple of weeks ago as the UK will not exist so Scotland will be treated as one of two sucessor states by the EU. “Lawyers for the EU said an independent Scotland could be treated as one of two successor states, and that a separate seat for Edinburgh would require only a majority vote among member states. At the European Council, where leaders stage decisive summits, a deal could be “done by the Council, using qualified majority voting and with the required say-so of the European Parliament,” said one of those lawyers. I should have also said that Scotland will take on a population share or GDP share (both roughtly 8.4%) of both UK assets and debts as per international convention. I think you are confused about “the Uk will not exist”. The UK was not formed by the Union of 1707. It was formed by the Union with Ireland in 1801. As long as there is part of Ireland in union with part of Britain (as defined by the 1801 act, as amended), then the UK will continue to exist. The Acts of 1707 created a Kingdom of Great Britain. The words “United Kingdom” didnt apepar until 1801. Also, accession to the EU can only be done by unanimous vote – thats quite clear in the Lison Treaty – whatever your lawyers said. Its whats happening with Croatia as we speak! No, you seem to be confused. The Treaty of Union formed the sovereign Parliament of Great Britain by combing the sovereign Kingdom of Scotland and sovereign Kingdom of England. Ireland joined in union in 1801 with Great Britain but if the original Treaty of Union is no longer upheld then there is no Great Britain which Ireland (later Northern Ireland) joined in union so there will be no UK. You may also find as Northern Ireland would also be defacto independent that they may not wish to renegotiate union with England and Wales and go alone as a seperate state but that will be up to the populations of England, Wales and Northern Ireland after Scotland becomes independent. The lawyers I mention are for the EU and this is the latest advise direct from the EU. You seem to confuse to Croatia who are an accession state to the EU with a member state who is already within the EU splitting as there is no current precedent so the precedent is now being set. Scotland and EWNI are already in the EU so the advise given is that they would be classed as two succesor states and then would each renegotiate their membership (due to rebate allocation, CFP, CAP etc). Have a read of the link I posted which will fill you in. 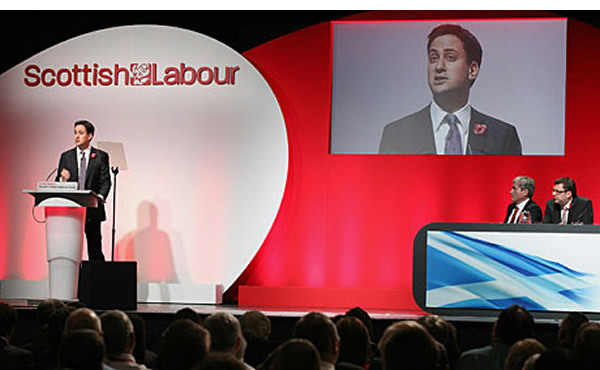 The speech yesterday in Glasgow from Ed Milliband was billed as his big speech outlining his vision for the union. In reality it was another speech with a lot of words yet devoid of content. It was a speech apparently making a positive case for Scotlands’ future in the Union but based entirely on the past with no reference to any future or any vision for Scotland. Not suprisingly the speech manages to include the Unionist full house of Fascism, Nazi’s and seperation. Not suprisingly the speech manages to include the full house of Fascism, Nazi’s and seperation and laughably thinks that the UK is an island. He wants to speak out against Scottish independence as his Belgian father came to England and joined the Royal Navy and “did his training aboard HMS Valorous, on the Firth of Forth”. Milliband seems to believe that this is positive a case for Scotland’s future being in the UK where in fact is a positive case for an independent Scotland in the EU. It highlights one of the core fundamentals of the EU, free movement of people, whereby a citizen of Belgium could move to live in rUK and work in an independent Scotland or vice versa. Regarding the upcoming referendum he stated “So let me say clearly – it is right that the people of Scotland decide the rules and timing of this referendum”. OK fair enough, the Scottish people and civic organisations are getting involved in the consultation process in order to bring forward a Devo-Max question which has the popular support of the Scottish people. So at at stroke he has echoed the Conservatives by ruling out a Devo-Max question on the ballot even before the people, groups and organisations of Scotland have taken part in the consultation. three quarters of the Scottish people clearly want. Milliband believes a story of ‘jam tomorrow’ will save this broken union but I am sure the SNP will have gained more members and the pro-independence camp more vote share with every pathetic droning word Milliband said with out raising a finger. Have a read of the Treaty of Lisbon and the Treaty of Union 1800. They’ll fill you in. By the way, the EU’s lawyers havnt made any announcement on this – and the Scottish Government seem to be VERY reluctant to publish the legal advice we know it has on whether Scotland would remain in the EU or have to re-apply. By the way, havnt you had the latest communication from “Dear Leader” yet? He now claims the UK WILL continue, and that independent Scotland will be a part of it! No, there is absolutely no way you should be allowed devo-max as an option. Have the guts to go it alone – fine. But don’t expect the English, Welsh and Northern Irish taxpayers to give you preferential treatment just because you’re more vociferous in your whingeing. In or out. Your choice. I’m fine with that, but under no circumstances should you be allowed to have your cake and eat it too. Referenda is about leaving the UK and becoming independent. Bit tough on Salmond, if he gets his vote to find that he has been black balled for membership of the EU.